New concerts added daily: Check the updated concert schedule! 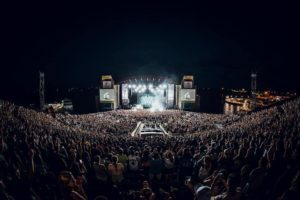 Any Long Island music lover will tell you: Jones Beach Amphitheater is the best place to see a summer concert! You’re right on the water and every seat is a good seat at Jones Beach Theater. Even concert tickets for seats in the upper levels give you such a great view of the stage, along with large-screen viewing. The Northwell Health at Jones Beach Theater VIP Tent allows easy concert viewing access for concert-goers who want to eat and drink with VIP seats not located in the skybox area. Make sure to bring something to cover up with, as all concerts throughout the Summer concert season end up giving you a chilly breeze or even a slight drizzle. Copyright © jonesbeachconcertschedule.com. All rights reserved.